The sports sedan comparable to admired German cars is a worthy nominee for North American Car of the Year. 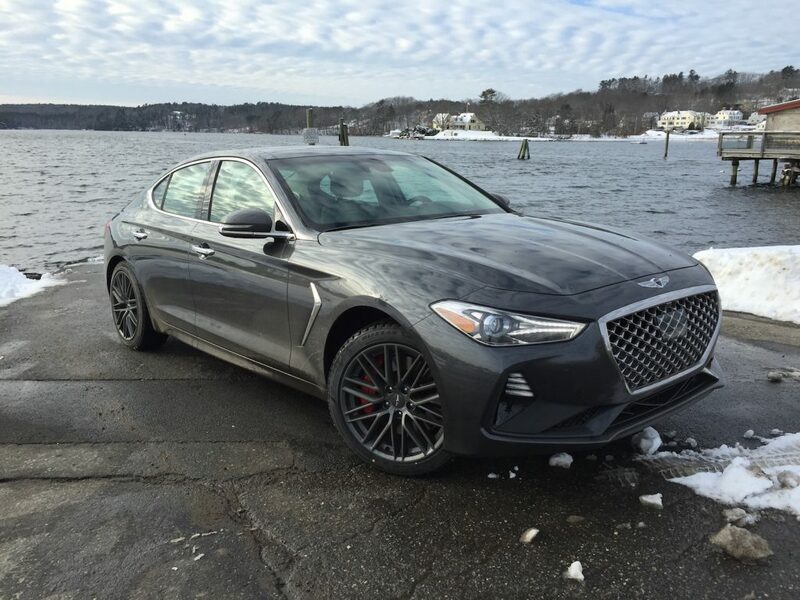 "The Genesis G70 has the necessary stance and performance of a mature sports sedan." Photo by Tim Plouff. Location: by the river in Damariscotta. Hyundai Motor Company has been using the Genesis title for 10 years now. The first rendition was a mid-size premium sedan and coupe series selling under the Hyundai showroom sign. Innovative, clean-sheet sedans in every sense of the word for the rapidly maturing Korean automaker, the cars’ arrival coincided with the financial swoon of 2009 and never got the planned market share despite widespread acclaim from critics. The vehicle reviewed Our top-end Prestige had an EPA mileage rating of 18/25 mpg on premium fuel, competitive with that of German sedans. Photo by Tim Plouff. Location: by the river in Damariscotta. Today, Genesis is a separate brand under the Hyundai umbrella – a premium lineup of three luxury class sedans, with two crossovers on the way. After some fits and starts, Genesis will generally be sold under its own signage, and often separately from Hyundai stores. Pricing starts at $34,900 for a 2.0-liter turbocharged sedan with rear drive and a manual transmission, rising to $38,895 for Sport trim. Note to sporty-sedan buyers: the Audi A4, BMW 3-series, Lexus IS and Mercedes C-class no longer are available with manual transmissions. AWD is available with the 2.0T engine, as well as our sampled 3.3-liter twin-turbo V-6. An eight-speed automatic augments the manual and is standard on the 3.3T. Horsepower ratings are 252 and 365 hp respectively. Our top-end Prestige had an EPA mileage rating of 18/25 mpg on recommended premium fuel. All these numbers are competitive with those of the vaunted German sedans. Arriving wearing the appropriate winter tires for the season, Bridgestone Blizzaks (hooray!) the sporty G70 got to show its street cred despite six of the seven days delivering some form of winter precipitation. 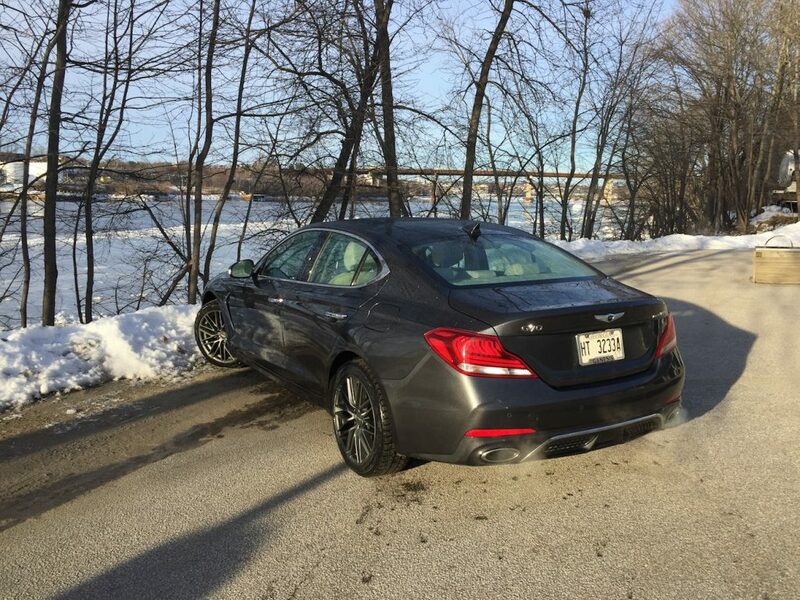 Hustling up and down the highway, or commuting over rural unplowed roads, the G70’s AWD system and the correct winter tires gave me the confidence to drive the car no matter what the conditions. This is key. In order to compete against the 3-series, the G70 has to have a great chassis, with excellent steering, brake, and driving feel. The Genesis delivered on all counts. The twin-turbo V-6 produced robust, smooth acceleration; the chassis rendered a terrific balance of sporty handling and ride compliance; and the steering feel, braking acumen, and general performance of the G70 are so comparable to the Germans’, most drivers would not be able to tell them apart if you removed the badges. This is also true with the car’s styling. The handsomely aggressive fascia stands out, and drew stares; the sculptured flanks create the muscular rear haunches that the German cars are famous for. More than a few admirers pointed to the Genesis hood emblem, probably because it is close to Aston Martin’s design. Wearing red Brembo calipers, racy 18-inch wheels, and the requisite dual exhaust pipes and a limited slip rear-differential to help create greater rear-driving feel for the AWD setup, the G70 has the necessary stance and performance of a mature sports sedan. Inside, quilted leather covers the door panel inserts and portions of the heated and cooled seats in Prestige trim. A sensible instrument layout uses knobs and buttons efficiently, and a touchscreen supplies additional entertainment and functionality. A 15-speaker Quantum Logic audio system, memory settings for the 16-way power seats, and an extensive list of electronic driving and safety aids are also included. Add Elite Package and gain rain-sensing wipers, larger sunroof, HID headlamps, surround view camera, and heated rear seats. Gripes are few. The console shifter works conventionally, but then you must press a separate button ahead of the shifter for the Park position. Why? 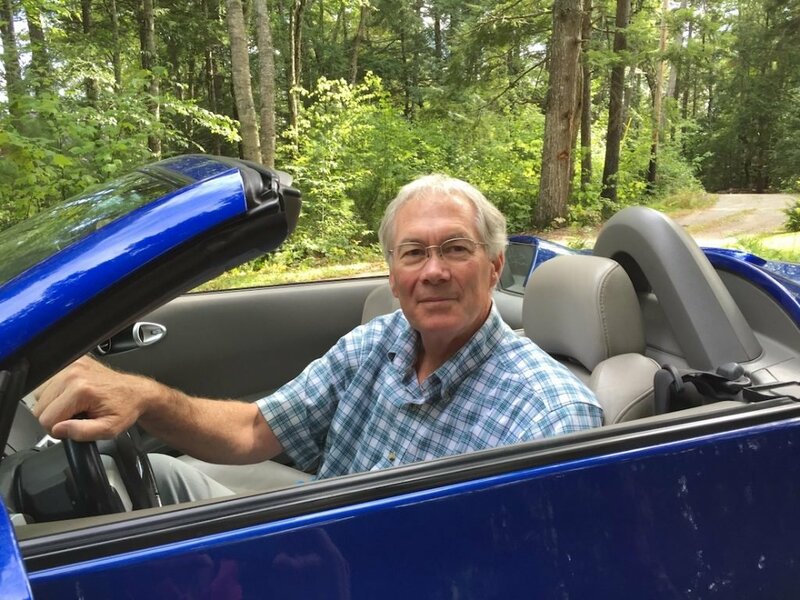 The supportive seats would be even better if they offered the manual thigh extenders that BMW features, and our sample car’s satellite radio reception seemed to struggle more than most in rural driving. Loosely based on last year’s Kia Stinger sports sedan platform – six-inch shorter body, but only two-inch shorter wheelbase – the G70 drives confidently and feels much lighter than its sibling. Twist the console dial for sport mode, and the Genesis’s taut suspension programming will bring a grin to the most hardened BMW fan. While that might sound ludicrous to some, the Genesis’s many accomplishments are mere highlights of how much work Hyundai has committed to its fledgling luxury brand. A nominee for the North American Car of the Year, plus Motor Trend’s Car of the Year, and one of Car & Driver’s Ten Best, the G70 is a complete sports sedan. Powerful, responsive, capable, and composed, the G70 undercuts the class leaders on price while over-delivering on performance. This car is a winner.